Ariana has been having a stellar few months thanks to the success of her fourth album Sweetener, which hit #1 in the UK album charts. 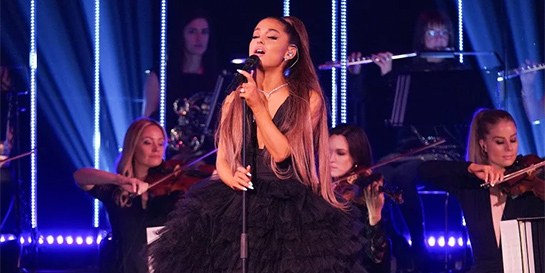 During Ariana Grande At The BBC, Billboard's newly-crowned Woman of the Year performed songs from Sweetener, as well as some of her biggest hits, accompanied by her band, an all-female 34-piece orchestra and 20-person choir. Recorded live in front of a studio audience during a promotional trip in September, the show saw Ariana talk to Davina McCall about her music, life and career, following on from previous BBC music specials that have featured Sam Smith, Adele, Michael Buble and Harry Styles. Ariana and Davina also touched upon last year's terrorist attack at Ariana’s concert in Manchester. She last appeared on BBC One when she headlined the One Love Manchester benefit concert which raised more than £10m to support the victims and their families.